It’s time to check out D.C.’s new waterfront playground. Water is magic. It brings out the best in everybody. This is certainly the case at Washington, D.C.’s new waterfront playground, The Wharf. Happy people are everywhere. Eating oysters. Cocktailing on rooftop bars. Buying a good read at D.C.’s beloved bookshop Politics and Prose. Listening to live music. Playing an oversized game of Scrabble. Roasting s’mores at a fire pit. Just sitting on a park bench taking in the scene along the Potomac River. 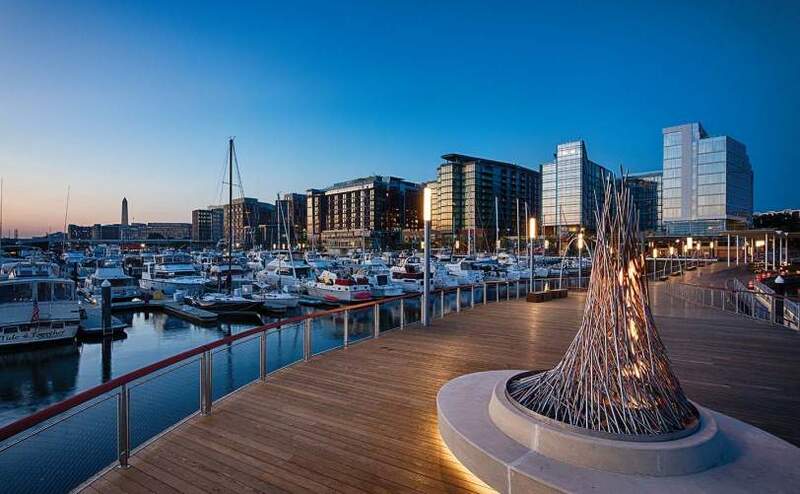 Formally known as District Wharf, the revitalized 74 acres of land and water in Southwest D.C. is the most new public space in the city since the redesign of the National Mall in 1902. The Southeast/Southwest Freeway cut the neighborhood of residences and Federal buildings off from the rest of the city in 1970. Except for the bustling Maine Avenue Fish Market (founded in 1805, it’s the longest continually operating fish market in the country), this stretch of waterfront hasn’t seen this much action since the river was the main transportation artery in the early 1800s. Since the opening of the first phase of The Wharf on Oct. 12, 2017—amazingly right on schedule—it has been packed with both locals and tourists enjoying the many different experiences you can have. A pedestrian walkway along the waterfront provides access to the Potomac River. Cafés front the brick, glass, stone and steel buildings along Wharf Street. Spaces for music—in public squares, on the District Pier, at The Anthem music hall, in bars and small clubs—make for a happening social scene. Parks and piers, where you can tie up your boat or rent a kayak or paddleboard, provide plenty of ways to enjoy the water. The Council’s annual Legislative & Working Groups Summit will once again be held at the Mandarin Oriental, Washington, D.C., Feb. 11-13. Two years ago, the hotel completed a renovation of the rooms, and it is as elegant as ever. You can walk to The Wharf in less than 15 minutes. To be in the center of the action, check out The Intercontinental Washington, D.C. - The Wharf. The most luxurious of the three hotels at The Wharf (The Canopy by Hilton and Hyatt House are the others), it ranked No. 1 in Conde Nast Traveler’s Top Hotels in Washington, D.C.: Reader’s Choice Awards 2018. As for dining, the days of Phillips Crab Deck are long gone. The goal was to attract best-in-class chefs and challenge them to do something new. Del Mar, by chef Fabio Trabocchi of the acclaimed Fiola, and Officina, by chef Nicholas Stefanelli of the Michelin-starred Masseria, are both outstanding. There are also plenty of kiosks selling all kinds of food to go and no-reservations restaurants. Savor oysters at Rappahannock Oyster Bar or Southern Italian “street food” at Lupo Marino (think fried artichokes hearts served with aioli). The former is located in a restored oyster shack that dates back to 1912 at the fish market. You can still see fishermen heaping Chesapeake Bay blue crabs into bushels at this open air, floating market, where a new distillery, a market hall and pavilions are in the works.